The Ontario Public Service Employees Union represents more than 155,000 frontline public sector workers. Click here to download a pdf version of the submission. Our members live, work, and raise their families in almost every community across the province, providing a vast range of public services and community supports that help keep Ontario safe, healthy, affordable, and prosperous. From across these diverse sectors and workplaces, OPSEU members report an urgent need for more investment. Ontario currently invests less per person in its public services than any other province. But despite the scare-mongering tactics being used to paint a dire picture of the province’s finances, the fact is that Ontario is wealthier than it has ever been and the provincial government can afford to make public service investments that will bring significant benefits in both the short and long-term. End the use of privatization in all its forms, and systematically re-examine currently privatized services with a view to bringing them back under public ownership and control. Reduce the number of public sector managers, and reinvest any savings in bolstering frontline staff. Give frontline public sector workers, through their unions, a meaningful voice in the design and delivery of public services. Immediately increase health investment by 5.3 per cent to meet population growth, aging, inflation and increased utilization, and commit to annual increases of at least the rate of health care inflation. Restore the minimum wage to $15 an hour for 2019, with provisions for annual cost-of-living increases in following years. Restore also a minimum number of paid sick days, scheduling rules to prevent last-minute shift cancellations, and equal pay for equal work provisions. Invest in our colleges and universities to ensure that Ontario is no longer in last place among provinces when it comes to per-student funding. Roll back the sale of alcohol in grocery stores, and take a firm stand against the expansion of alcohol sales into convenience and box stores. Give municipalities the right to choose the LCBO as the cannabis retailer in their communities. Invest in creating and enforcing strong regulations governing the Passport program to ensure that developmental services clients are served by a well- trained stable workforce that earns a living wage. Immediately hire 250 new full- time Correctional Officers, 200 Probation and Parole Officers, as well as correctional health care and rehabilitation staff. Invest in the creation, inspection and enforcement of strong regulations that keep Ontarians safe and healthy. As frontline workers dealing every day with millions of Ontarians, OPSEU members have unique insight about our public services, and how they can be sustainably and effectively improved. And as an open and democratic union, OPSEU actively encourages its members to share these insights. That is where the proposals in this submission come from—straight from the frontline. Investing in your home makes it more livable and valuable. Investing in your education makes you more attractive to employers and increases your earning power. Likewise, investing in strong public services makes your province safer, healthier, more affordable, and more prosperous. And the truth is, Ontario can afford to invest in itself. The province is wealthier than it has ever been. Our gross domestic product (GDP) has never been bigger. Not only is our GDP bigger than ever, our GDP-per-person is at an historic high. We are more productive, more innovative, and wealthier than we have ever been. Sadly, we are not investing our wealth in ourselves and our future. In fact, Ontario invests less per person in its public services than any other province in the country. Underinvestment in a public service obviously has direct consequences on the Ontarians who rely on that service: they must wait longer for lower-quality service. But underinvestment in a service often has other consequences, too. It creates a ripple effect that spreads out, straining and weakening other public services in a vicious cycle. Underinvestment in mental health, for example, means that more people end up in jail. Underinvestment in education means that more people are forced to rely on social services. Underinvestment in social services means more hospital visits, and fewer Ontarians able to contribute to their communities and our economy. Fortunately, the reverse also holds true. Proper investment in mental health will reduce the strain on our jails. Investment in education will reduce the strain on social services. And investment in social services will mean more people living healthier, more productive lives. By properly investing in our public services, the vicious cycle can be turned into a virtuous circle. If Ontario is richer than it has ever been, why is our government struggling to find the revenue to invest properly in our public services? One of the main causes can be summed up in a single word answer: privatization. From one end of the province to the other, OPSEU members are reporting that privatization is creeping ever deeper into our public services. It is happening in the Ontario Public Service (OPS), corrections, health care, education, liquor and cannabis sales, social services, and every other public service in between. Unfortunately, privatization rarely – if ever – delivers on its grandiose promises to lower costs and improve quality. The opposite is almost always true: privatization leads to increased costs and lower quality while sending Ontario’s public wealth into the hands of an already wealthy few. Since Hydro privatization began in the late 1990s, rates have tripled and the province has lost billions in revenue. The Auditor General examined a decade of privately financed infrastructure projects and found that the people of Ontario were overcharged for them by more than $8 billion. Even worse, these “P3” schemes have left us saddled with facilities such as Waypoint Mental Health Centre or the Toronto South Detention Centre that are dangerous because of shoddy design and construction. Privatized medical lab testing takes longer than traditional hospital-based testing and costs up to 50 per cent more. Meanwhile, reversing privatization often yields significant benefits. When Hamilton made its water system public again, quality improved and the city saved millions. It was the same story when Timmins brought snow-plowing back in-house: quality rose and costs dropped. And when the government brought a Toronto cancer clinic back under public ownership and management, the costs per treatment dropped significantly. Government can take a significant step towards reducing costs while increasing quality and accountability by taking a firm stand against privatization. Ontario’s health care system is a point of pride for all the people of this province regardless of their political, social or economic stripe. But years of underinvestment have strained health care towards the breaking point, opening the door to strong forces working against the people; forces that stand to profit from the privatization of our health care system. As more services are privatized, out-of- pocket costs rise for patients, health care jobs become more precarious with fewer benefits and security, and wealth inequality continues to rise, making life less affordable for the vast majority of the people. If government is really for the people, it must not let this happen. Ontario ranks near the very bottom of all provinces when it comes to per capita health care funding. According to a number of experts, including Ontario’s Financial Accountability Officer, provincial health care investment is not keeping pace with the annual health care inflation rate, leaving us unable to meet the demands of population growth, aging, and increased utilization. Health care is the single largest program expenditure in the Ontario budget, yet there has been no provincial capacity planning since 2000. This has resulted in a significant disconnect between population need and the levels of service and staff that are actually funded. It is time for a budget that is truly for the people; one that recognizes that Ontario’s health care system functions like an ecosystem – when funding for services and staffing gets slashed in one area, there are consequences across the entire system. When mental health care is underfunded, hospitals are impacted. When hospitals are underfunded, more pressure is placed on already-overstretched home and community care, long-term care and ambulance services. When services are underfunded today, it does not save money; it costs more in the long run and hurts many people in the process. It is time for long-term planning and investment, not more cuts and privatization. Increase hospital investment by 5.3 per cent to match the rate of health care inflation and maintain existing service levels. To effectively combat hallway health care and bring bed occupancy rates below 85 per cent (broadly considered the safe level), government must focus on health system planning and long-term investments to ensure that population need is met. This includes immediately boosting hospital investment by 5.3 per cent, and increasing that investment annually by at least the rate of health care inflation. The government’s recent short-term funding commitment of $90 million is nowhere near enough to combat hallway health care. Stop and roll back costly privatization schemes. From using public-private partnerships to build hospitals to privatizing medical lab testing and services like housekeeping, privatization has done serious damage to our health care system. Eliminating privatization is an important step towards controlling costs and ensuring the highest possible quality of care. For example, bringing lab testing back into public hospitals would reduce costs by 50 per cent, cut wait times, and improve quality inspection control. Improve hospital capacity and ensure safe levels of hospital services, beds and appropriate staffing levels. Ontario’s hospitals are hubs of care in our communities. Hiving-off services like cataract procedures, hip and knee replacements, colonoscopies/endoscopies and diagnostic imaging to private, for-profit clinics costs more, and compromises the quality of care. Instead, the government must improve hospital capacity to meet population need in all communities. That includes ensuring safe levels of hospital services, beds, and appropriate staffing levels to coincide with bed increases. When it comes to tackling wait times, hospital professionals who provide diagnostic and rehabilitative services play a crucial role. Expand inpatient and outpatient physiotherapy services across all hospitals to improve access. The demand for inpatient and outpatient physiotherapy services is exceeding service levels. It is important to expand these services across all hospitals in Ontario because improved access to physiotherapy reduces the time patients spend in hospital, thereby reducing costs and improving health outcomes. Impose a moratorium on hospital closures and costly mergers. The persistent rhetoric around “finding efficiencies through consolidation” has proven false. By consolidating services into fewer sites (most often in larger urban centres), hospital corporations have cut spending by cutting services from the smaller, often rural hospital sites. Community hospitals are already overstretched financially, yet they are forced to pay for restructuring out of their own operating budgets, with dire implications for the delivery of health care services. The hospital overcrowding crisis has led to more and more patients being pushed too quickly into the home care system, stretching home care beyond its limits. It is simply unable to adequately care for more patients who are more sick. Immediately increase investment to cover the true cost of home care. Home and community care workers need the resources to keep people at home safely and to ensure positive patient outcomes. Eliminate redundancies by improving the democratic accountability of Local Health Integration Networks (LHINs) and contracting-in the management and delivery of home and community care. By ensuring that Ontario’s LHIN boards are democratically elected and accountable to the public, government can effectively contract- in the management and delivery of home and community care. Currently, there are more than 160 separate third- party agencies providing home and community care services – the majority of which are private, for-profit entities. Each agency has its own infrastructure, layers of bureaucracy, and demand for profit. By contracting-in, we could eliminate the immense redundancies that plague Ontario’s home care system. The Ontario government should end contracting-out by exploring all options for termination or non-renewal of existing contracts with provider agencies and focus on investing in a fully public, non-profit home care system instead; one where quality patient care is the focus. Promote fairness and stability in Ontario’s home and community care sector by reviewing the work being done by registered nursing staff to improve the recognition of their skills and abilities. Quality patient care also depends on respect for frontline workers. Personal Support Workers (PSWs) have harmonized per-visit rates and an established minimum wage rate. This is not the case for registered health care staff such as Registered Practical Nurses. These staff face stagnant wages, precarious contracts, few benefits, and they bear the responsibility for high employment costs such as having access to a car. As a result, the sector has been plagued by high rates of staff turnover, and an ongoing shortage of nursing staff. Ontario’s long-term care sector is the wild west of health care. The wait list for long-term care beds has exceeded 20,000 since the 1990s, and as of April 2018, had reached 32,835. And when an Ontarian does get a long-term care spot, they face the lowest standards in all of Canada, and among the lowest care levels among comparable jurisdictions even though patient acuity and the complexity of care is growing. Since 2010, only those with high or very high care needs have been deemed eligible for long-term care, and many of them have cognitive or behavioural problems. Staff are increasingly overworked and expected to do more with less. Invest in reducing the large and growing wait list for long-term care by creating more publicly owned and managed long-term care facilities. With the proliferation of privately operated homes, residents are increasingly forced to pay massive out- of-pocket costs or face an impenetrable wait list for publicly funded long-term care. As a result, residents are suffering. It is why the government must take immediate action to address the large and long-standing wait list for long- term care and invest in publicly funded, non-profit long-term care beds. Last fall’s commitment by the provincial government to open 6,000 new beds doesn’t go far enough to address the waitlist of 32,835. Increase long-term care staffing levels to ensure a minimum care standard of four worked hours of personal care, per resident, per day, is achieved. Long-term care residents deserve the highest quality of care possible. New investment is required to increase staffing levels and to ensure a minimum care standard of four worked hours of hands-on personal care, per resident, per day. Provide appropriate staff training to minimize exposure to workplace violence, including training on responsive behaviours. Today, 46 per cent of long-term care residents exhibit some level of aggressive behaviour related to their cognitive impairment or mental health condition. As patient acuity continues to grow, the government must commit to developing a provincial strategy to improve access to specialized seniors’ mental health services and increase access to specialized long-term care homes. Strengthen and enforce minimum standards of care. People living in long-term care must be able to count on safe, professional, and high-quality care. Minimum standards must be strengthened for all long-term care facilities, particularly those that are privately owned and managed. And those standards must be enforced by an appropriate number of professional frontline OPS inspectors. Ontario’s Ambulance Communications Officers (ACOs) and paramedics are often the first line of defense in a medical emergency. Ontario’s EMS/911 system works well and saves lives every day. But demands on the system are growing by six per cent a year. Additionally, the ongoing hallway medicine crisis in the province’s hospitals is putting unsustainable pressure on paramedics – they are often stuck waiting for hours to offload patients at the Emergency Department because the hospital has no available beds. Reduce ambulance offload delays by investing in more hospital beds. The hospital bed crisis has had a system-wide domino effect, and its ripples are being felt on the frontlines of emergency medicine. In order to reduce major hospital offload delays, the government must improve hospital funding, hospital occupancy standards, and hospital bed capacity. Expand community paramedic programs that deliver non- emergency, in-home services and reduce the number of 911 calls. Invest in appropriate tools, resources and staffing at Ontario’s Central Ambulance Communications Centres (CACCs) and hire more permanent, full-time Ambulance Communications Officers (ACOs). Recent media reports have highlighted the pitfalls of severe staffing shortages in Ontario’s CACCs. Just recently, all ACOs working out of the Cambridge CACC were “temporarily” relocated to Hamilton because of a crisis-level staff shortage. Too often, staff are working on a contract basis, with little job protection and high exposure to trauma and PTSD. This has undoubtedly resulted in high staff turnover and pervasive short-staffing has become the new “norm.” This is not acceptable. The provincial government must provide the appropriate tools, resources and staffing at all of Ontario’s CACCs. This includes hiring more permanent, full-time ACOs immediately. Saving lives means focusing on permanent solutions, not makeshift mitigation tactics. No worker should fear for their life when they go to work. But this is a reality for thousands of mental health care workers who face increasing exposure to violent assaults. If staff are not safe, neither are patients. The government simply isn’t investing enough to prevent this violence. Immediately invest in preventing violence against mental health workers. To address the high risks faced by workers in mental health facilities, government must invest in increasing staffing levels and implementing better risk assessment procedures, including the system-wide use of the Violence, Aggression and Response Behaviours Tools (VARB) for assessing security, conducting organizational risk assessments and assessing individual client behaviour. Extend PTSD presumptive legislation so that health care workers are entitled to WSIB. For frontline mental health workers who have experienced trauma, it is crucial that the PTSD presumptive legislation be extended so that health care workers are entitled to WSIB. By extending the legislation, mental health care workers would have faster access to the resources and treatment they require. This would improve health outcomes and reduce longer-term health care costs. Invest in more supportive housing for mental health and addictions patients that is appropriately staffed. Supportive housing is an integral resource for mental health and addictions patients, but improved investment is required. These homes must also be staffed at appropriate levels by professionals including Social Workers, Occupational Therapists, Recreational Therapists, Registered Nurses and Registered Practical Nurses. Investing in the right care means focusing on long-term solutions, not band aid fixes. Provide all mental health and addictions services on a fully public, non-profit basis with full public accountability. Like many other health sectors, the mental health and addictions sector has been plagued by costly privatization schemes. Privately owned and operated methadone clinics are one troubling example. Methadone is frequently prescribed for people who are seeking treatment for opiate dependency. The goal is to prevent death, reduce harm, and support rehabilitation. But the current system is not well-integrated, and people are not being treated holistically. That’s because addictions services have become a lucrative industry. There is profit to be made from the distribution of methadone, giving clinic owners very little incentive to reduce users’ dosages. This is an unsettling example of the corrosiveness of privatization when it comes to public health care and improving health outcomes. All mental health and addictions services should be provided on a fully public, non-profit basis with full public accountability. The government must increase the resources provided, and ensure these resources are made available in all communities. Ontario’s public blood system works because Ontarians believe in giving. In fact, Canada is completely self-sufficient when it comes to blood collection and supply. Unfortunately, the same cannot be said for our supply of fractionated plasma products, which are used to produce medications. Ontario depends on world markets for plasma products used to produce medications, much of which is collected through paying donors. Maintain the ban on private blood and plasma-product collection to ensure the ongoing safety of Ontario’s blood supply, and invest in public plasma collection facilities. The government must invest in public plasma collection facilities to reduce dependency on world markets for the fractionated plasma products used to produce medications, much of which is collected by paying donors. To achieve the highest quality and standards of safety, the government must stem the growth of private clinics. Promote fairness for laboratory technicians, regardless of their workplace. The diagnostic testing done by laboratory staff at Public Health Ontario is vital work that prevents public health crises like Walkerton, SARS and other outbreaks. This work keeps our communities safe, and it is vital to the health of all Ontarians. But public services are stronger when workers are treated fairly. OPSEU is calling on the government to harmonize the pay and working conditions for all laboratory technicians, regardless of whether they work in community hospitals or community-based laboratories. OPSEU members are at the heart of the Ontario Public Service (OPS). We represent more than 35,000 Ontarians working directly for the province’s 23 government ministries. Our members are constantly flagging issues and improvements that can be made to the services provided by their particular ministry. After consulting with OPSEU’s democratically elected leaders representing our members in the OPS, we have identified the following five overarching proposals to improve the efficiency and effectiveness of all the services provided by the OPS. Privatized services. Services such as highway maintenance and snow- plowing, driver testing and licensing, ServiceOntario Centres, and email and IT systems have been privatized. Quality has suffered, and costs have increased. Privatized public assets. The sell-off of publicly owned assets and entities have cost Ontario billions upon billions of dollars in lost revenue and increased prices. The sale of Hydro One, Highway 407, and OLG casinos across the province are just three of a number of examples of public asset sales that result in generations of financial loss. Privatized construction financing. Infrastructure and facility construction projects financed through public-private partnerships and “alternative financing and procurement” contracts have ended up costing much more than if government had simply financed the projects with the low interest rates it can command. In 2015, the Auditor General found that Ontarians had been overcharged by more than $8 billion for privatized infrastructure projects over the previous 10 years. Private consultants. The overuse of private consultants has reached epidemic levels in the OPS. The Auditor General found in 2016 that the Treasury Board Secretariat was using consultants 90 per cent of the time when filling staffing requests for IT workers, adding that each consultant costs $40,000 more per year than a permanent employee would. Revisiting the issue in 2018, the Auditor General stated that “there is still an over-reliance on IT consultants” and “that ministries at times used consultants for ongoing or operational work that could have been undertaken more cost-effectively by full-time permanent or term employees.” It’s not just money that we lose to consultants, it’s also vital experience. Once the job is done, so is the consultant. But if the work had been done by a permanent employee, their experience and expertise would remain in the OPS to the benefit of the people of Ontario. Drastically reduce the number of managers and reinvest those savings in strengthening the frontlines. Over the past 30 years, the number of OPS managers has grown, while the number of frontline workers has shrunk. Senior management says the ratio of staff to managers across the OPS now stands at 1:7. In some ministries, the ratio is even more unsustainable. In the Ministry of Economic Development, Job Creation and Trade, OPSEU members report the ratio is 1:4. Members at other ministries report it’s as high as 1:3. Having too many managers is a waste of resources and reduces the quality of service that everyday Ontarians depend upon. The money spent on management salaries and perks is much more wisely invested in strong and effective frontline staff. Even simply filling vacancies and hiring an appropriate number of staff would yield significant efficiencies and improvements, cutting the unnecessary costs of overtime, training temporary contract workers, and reducing the burn-out that inevitably results from unsustainable workloads. Invest in the inspection and enforcement of strong regulations that keep Ontarians safe and healthy. Regulations are often derided as meaningless “red tape.” But the truth is that strongly enforced regulations save lives and, ultimately, money. Cutting regulations, and the frontline OPS workers who enforce them, will end up costing Ontarians dearly. Private-sector “self-regulation” simply cannot be trusted. Time and again, we have seen examples of private corporations maximizing profits by cutting corners and turning a blind eye to problems. The results can be disastrous. The Aylmer Meat Scandal. The Sunrise Propane explosion. Walkerton. All could have been avoided with strong regulations strongly enforced. Invest in improving OPS management’s human resources practices. A chronic and wasteful problem across the OPS is management’s inability to quickly and effectively resolve disputes over its collective agreement. 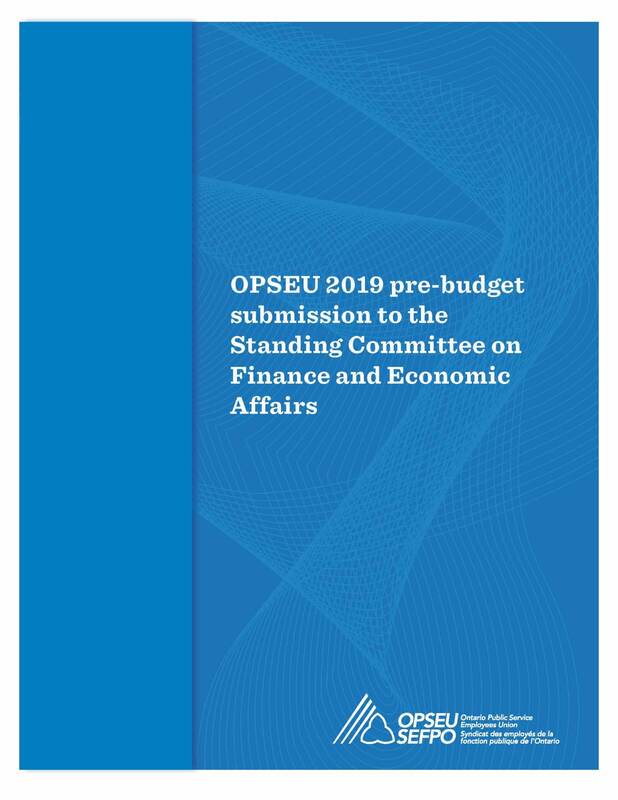 Although many grievances can and should be solved by the direct manager, OPSEU stewards and ministry leaders report that almost every single grievance is being pushed to an expensive and time-consuming formal hearing. Training managers on collective agreement dispute resolution, and empowering them to resolve grievances quickly and effectively, would save significant amounts of money and lost productivity. Commit to ensuring that the increased use of online and digital services does not reduce Ontarians’ access to personal and human contact. Citizens will benefit if they can access their public services online, but only if those online services give them prompt and meaningful access to frontline workers who are trained to help them. Technological advances are not a replacement for frontline workers who can answer questions and provide useful support and direction for individual and special cases that come up every day. Ensure that Ontarians who need ODSP support are not excluded by a change in the definition of “disability”, or by technology that is difficult to use. Changing the ODSP definition of “disability” to the one used by the Canada Pension Plan (CPP) will make it harder for people with disabilities to qualify for ODSP, because the CPP definition doesn’t take into account disabilities that are temporary or episodic in nature. Moving people with disabilities into the Ontario Works program is completely inappropriate. The drastic cut in benefit rates between the two programs, and the lack of appropriate supports in the OW program, will leave people with disabilities destitute. The current move to digitalizing administrative work (e.g. online applications, online accounts, etc.) creates barriers for many clients who may not have the skills or access to the required technology. When working with vulnerable clients, technology is not a good replacement for human interaction. Ensure caseworkers have manageable caseloads and are focused on helping, not policing, their clients. Investment is required to ensure a manageable worker-to-client ratio. It is not reasonable to assume that every client is ready to join the workforce. Instead of solely focusing on getting people back to work, we need to focus on the reasons why people aren’t able to work, and try to help them fix those problems. For caseworkers to truly help clients, they need reasonable caseloads and the mandate to focus on helping clients solve daily problems and increase their life skills instead of focusing on paperwork and rule enforcement. Currently, despite overwhelming caseloads, caseworkers do their best to assist their clients with these issues. Caseworkers need to be provided with adequate and proper training in order to meet the needs of their clients and to help them overcome barriers to employment. Restore the planned increases to social assistance rates, and guarantee that they rise by the rate of inflation every year. When you do not have enough money to pay the rent, or to feed yourself or your children, you cannot concentrate on looking for work. Being in constant survival mode is a huge barrier to finding work. Ensuring that social assistance recipients receive enough money to maintain their health, their dignity, and to take care of their families is the first step towards ensuring that those who are able to work can carry out a meaningful search for work. As 2019 begins, there is no resolution in sight for the crisis in corrections. Our correctional facilities are overcrowded, dangerous, and in serious disrepair. Even worse, chronic understaffing is resulting in more violence, more mental health issues, and more PTSD. And when offenders are released on probation or parole, they are practically free to do as they please – severe understaffing means that probation and parole officers have impossibly large caseloads and are simply unable to provide safe and meaningful supervision. The ultimate goal of a correctional system is to rehabilitate offenders so they can re-enter our communities and neighbourhoods as safe and productive members of society. However, Ontario’s correctional system is doing the exact opposite: offenders are leaving jail more violent, more unstable, and more likely to commit more crimes. Immediately hire 250 new full-time Correctional Officers, and commit to regular post audits at all 25 correctional institutions. Today’s correctional officer numbers are based on staffing models from 1980s workload formulas. We need immediate funding for 250 new full-time correctional officers, with ongoing post audits at all 25 correctional institutions. More positions will likely be needed after fulsome post audits are completed at every one of Ontario’s 25 institutions. These post audits must be completed by representatives from both OPSEU and management within three months. Invest in 200 new frontline Probation and Parole Officers. As of September 30, 2018, 40,666 offenders were being supervised by just 865 Ontario Probation and Parole Officers, of which just 824 were carrying cases — one of the highest, if not the highest, caseloads in the country. Combined with the fact that Ontario has the country’s highest rate of recidivism, and the dramatic increase of offenders with mental health needs, this understaffing is a disaster waiting to happen. In order to meet government standards for offender supervision, immediate investment is vital. Immediately hire new correctional health care and rehabilitation staff. Our correctional system does not have nearly enough health care and rehabilitation staff. Government must invest in more health-care staff and other ministry staff in Ontario’s correctional institutions to ensure the safety of offenders and staff, the proper provision of health care, and humane conditions. Through public financing and management, build new correctional institutions. Crumbling and overcrowded jails in Thunder Bay, Ottawa, and other communities need to be rebuilt. But they must not be built through “public-private partnerships” or any other form of privatization. We must learn from the lessons of the Toronto South Detention Centre and the Waypoint Centre for Mental Health Care, where P3 schemes have resulted in dangerously inadequate design and construction and incredibly high costs for modifications and renovations. Invest in safe and effective management strategies for segregation and alternative housing units. Upon the release of reports by Sapers and Dubé in 2017 regarding the ill effects of segregation, the government placed limits on time spent by offenders in segregation. But government failed to provide frontline staff with replacement tools to deter hostile and violent inmate behaviour. The end result has been an exponential increase in assaults and threats against staff. 2017 saw 544 assaults, 347 attempted assaults, and 669 threats of assault against correctional staff members. Investment is needed to build safe and appropriate special-handling units to house and manage our most violent inmates securely. Invest in modern safety equipment and training. The ministry must invest in overall safety inside our institutions by introducing conducted energy devices, bona fide inmate deterrent strategies, immediate rapid response teams, and modernized self-defence training. Invest in proper treatment for those suffering PTSD. Correctional officers struggle with the highest rates of PTSD among all first responders. Adequate mental health treatment and education must be provided. There needs to be financial commitment to develop a peer support system for correctional staff, and the current cap of $25 an hour for psychological services must be removed without cutbacks to other employee benefits. Approach collective bargaining as a means to retain staff, not save money. Wages within the corrections sector are significantly lower than their counterparts. Attracting and retaining professional frontline workers starts with competitive wage and benefit packages. Government must bargain with its frontline corrections workers in the same manner as it has with other first responders. Government must realize that an investment in correctional services is an indirect investment in health, education, and sound social services. We all benefit from strong social services because they help people live a dignified and productive life, even when they encounter difficulties. We all use social services at one point or another—they’re what holds our society together. Underinvesting in social services comes with both short-term and long-term consequences. But when we respond to needs by investing properly in social services, everybody does better. The developmental services sector has struggled for years to address the systemic waitlist crisis due to the inadequate supply of supportive housing and day programs for adults with developmental disabilities. The steady increase in direct funding to families has done little to address this crisis. It has instead exposed the growth of an informal, precarious workforce that has undermined the province’s implementation of a successful Human Resources Strategy (launched in 2014) designed to improve quality service. Create a regulatory framework for the Passport program. This will protect clients, promote access to services, and ensure a well-trained, stable workforce that makes a living wage. Create a central bargaining table. This will create standards for working conditions that would realize the goal of making developmental services work a career of choice, (stemming chronic retention problems), and reducing the number of developmental services workers stuck in part-time positions (which now stands at 75 per cent). Child protection services have undergone decades of constant changes in reporting requirements, new information technology, and a shift away from providing prevention services to focusing on core protection. Child protection workers are like first responders. They face numerous health and safety hazards ranging from vicarious trauma to physical assault. Address key health-and-safety issues. Establish a provincial requirement for workers to co-team when making home visits. Reduce the administrative burden. Child protection workers now spend up to three to five times longer to complete administrative tasks using the new Child Protection Information Network database. Establish provincial caseload benchmarks to guarantee a consistent quality of service and the ability to meet provincial standards. The greatest challenge in children’s treatment and mental health is the inability to provide care to all the children and youth who need it. For years, this sector has seen tremendous growth in demand while base budgets have remained largely stagnant. Ontario has 35 per cent fewer mental health beds today than it did in 2006. Eliminate the 18-month wait times by investing in more mental health beds across the province. More than 12,000 children and youth in Ontario are currently waiting for children’s mental health support. Harmonize the pay and working conditions. The sector’s mental health professionals deserve wages and working conditions on par with their counterparts in the health and education sectors. Ontario has the highest child care fees in the country and not enough quality child care spaces. Ontario needs to develop a public not-for-profit system that is affordable, and is staffed by a stable, qualified workforce. Sadly, the government recently chose to listen to the corporate sector and has removed the “For-Profit Maximum Percentage Threshold.” This cap helped prioritize the expansion of public child care over private providers. Invest in the promised 100,000 new child care spaces — part of the space expansion plan initiated in 2017. Implement a workforce strategy to ensure all staff have professional pay and decent work. The government announced in November an increase of $11.5 million towards frontline services, to be spread across 400 agencies with about one-third going toward Indigenous centres. This works out to just $30,000 per agency, which is dramatically short of the promised 33 per cent increase. Provide the promised 33 per cent funding increase to violence against women shelters across the province. These shelters have been struggling to stay afloat for years. There are currently not enough spaces for women and children fleeing violence. Currently there are two parallel systems providing youth justice services: one set of facilities directly owned and operated by government, and another set of facilities owned and operated by transfer payment agencies. A government-commissioned review panel for residential services found that these two systems have no consistent standards for hiring, training, and compensation for staff and no mechanisms to ensure consistency of practice across the two systems. Create a single, integrated system for youth justice, directly operated by government. A single system would improve and standardize training, hiring practices, health and safety, policies and procedures, standards and compensation. The elimination of the Ontario Child Advocate Office is a step backward. Ontario is now in the minority, joining just two other provinces who do not have a child advocate office. We have lost an independent voice for vulnerable children and youth who receive care through the youth justice, child protection and mental health systems. The advocate’s office was uniquely positioned to investigate individual cases of abuse and mistreatment, but was also empowered to conduct systemic investigations and review government policy and practice around services to children. Reinstate the Office of the Provincial Child Advocate. Ontario is now in the minority joining two other provinces who do not have a child advocate office (Nova Scotia and PEI). In the absence of whistleblower legislation, OPSEU members are not free to speak up. But the Child Advocate is, and always has been. The OPSEU members at Legal Aid Ontario (LAO) provide crucial legal and administrative support to Ontarians who aren’t able to afford their own private legal counsel. Without LAO, the wealthy would have an unfair advantage in the courts. But OPSEU members at LAO report that years of cut and mismanagement have left Legal Aid less and less able to even the legal playing field – both through the services it provides directly, and also through its support of other community legal clinics. Invest an appropriate amount in LAO to allow it to fulfil its mandate. Years of cuts of underinvestment have forced LAO to ration its services, exacerbating a two-tier justice system. This is unacceptable. Legal Aid needs appropriate investment to ensure that all Ontarians have equal access to justice. Specifically, OPSEU members at LAO report that staffing and working conditions require significant improvement so that caseloads are manageable and that staff at all levels have the wages and job security required to provide their vital services in a professional and timely manner. Community legal clinics that support clients who can’t afford legal services need stable investment. The Human Rights Legal Support Centre (HRLSC) is facing a 10 per cent funding cut targeting the elimination of their mediation program, and Parkdale Community Legal Services (PCLS) is not being guaranteed long‑term funding from Legal Aid Ontario for a lease in Parkdale despite facing eviction by its current landlord. The work these clinics do in Parkdale and across the province for vulnerable clients is too important to cut. Government must reverse its decision to cut 10 per cent of the funding to the Human Rights Legal Support Centre. Their mediation program, which the Ministry is targeting for elimination through this cut, has been shown to be an extremely cost-effective way to resolve human rights disputes between parties at the Human Rights Tribunal by diverting them from more expensive litigation. The program is so efficient that the mediation team won an Amethyst Award from the Ontario Public Service for service excellence. Cutting the funding for this program is penny-wise and pound-foolish, and an attack on the human rights of the people of Ontario. Government must ensure that Legal Aid Ontario has the resources to fund vitally important services to vulnerable clients of legal clinics like Parkdale Community Legal Services. Parkdale Community Legal Services has a long history of providing crucial support in its community, and it must have enough secure funding to be situated where their clients can easily access its services. The LCBO is a crown jewel: a public retailer of a controlled substance with exemplary social responsibility initiatives that is renowned for balancing public safety and responsible profit-making. The LCBO is an asset owned by the people of this province – its true value expands far beyond its retail capacity. It’s not surprising that Ontarians trust the LCBO to keep our children and communities safe because it has a proven track record. In fact, Ontarians are 12 times more likely to choose the LCBO over private stores to keep beer and wine out of the hands of underage youth. But the expansion of alcohol sales to private retailers threatens the survival of this valuable public asset. OPSEU represents 8,500 members at the LCBO working in 663 retail stores, five warehouses and at head office. Our members are key to the LCBO’s success. The 140 million customer transactions that drove $6.2 billion in sales in 2017-18 simply could not have happened without our retail, logistics, and head office members doing their jobs in a diligent and professional manner. In the 2018 fiscal year alone, the LCBO contributed $2.12 billion to Ontario’s coffers to pay for schools, hospitals and other vital public services. In addition, the LCBO paid $32 million to municipalities in the form of property taxes and fundraised millions of dollars for organizations such as the United Way, children’s hospitals and MADD Canada. An important part of the LCBO’s mandate is to sell alcohol in a safe and responsible way. In 2017-18, our members challenged nearly 14 million customers and refused service to 255,000 people. When our members are hired, they receive industry leading in-person training on the LCBO’s Check 25 and Challenge and Refusal programs and receive annual follow-up training. Conversely, major concerns exist about the impact of privatized and expanded alcohol sales on public health. After the partial privatization of alcohol sales in British Columbia, researchers identified an increase in alcohol-related deaths. The association identified between privatization, increased density of retail outlets and mortality raises serious concerns about the Ontario government’s plan to expand sales to big box, convenience and more grocery stores in this province. Support the public model of alcohol sales and freeze plans to expand the sale of alcohol to private retailers. In order to keep our communities safe and ensure maximum public revenues, government must support the public LCBO over private retailers. Immediate and proactive action is needed on the issue of theft. In some stores, thousands of dollars’ worth of alcohol is stolen in a single day. Theft is a critical health and safety issue and both LCBO management and the provincial government have a legal obligation under the Occupational Health and Safety Act to ensure staff are safe. The LCBO must provide more consistent security in stores, particularly those hardest hit by theft. Sporadic protection isn’t doing the job. The LCBO must act to deter thieves with round-the-clock security at all the stores at the top of the hit list. Scheduling appropriate numbers of retail staff instead of cutting hours must also be the new normal. No one should work alone. With the legalization of recreational cannabis, we have stepped into the unknown. It is the most significant public policy shift Canada has seen in generations. While it is an important step for destigmatizing the use of cannabis – particularly for those consuming it for medical reasons – no one can deny that legalization brings significant risks. Medical evidence suggests that cannabis use can have long-term health consequences for people younger than 25. And since Canada is a world-leader on cannabis legalization, we have no clear idea of how it will affect community health and safety. Recent public opinion research shows that the people of Ontario are worried about these risks and want a responsible plan for cannabis sales. Allow the LCBO to sell cannabis. The LCBO has a long and proven track record of selling alcohol responsibly and maximizing public revenues. The government must give municipalities the option of choosing the LCBO as the retailer of cannabis in their communities. Recognize the right of cannabis warehouse workers to join a union. Like all Canadians, the workers at the cannabis warehouse in Oakville have the Constitutional right to join a union. Government must not use police forces to intimidate workers or the organizers helping them exercise their rights. OPSEU members at Ontario’s colleges and universities provide the training and services that are central to our province’s economic innovation and strength. Ontario cannot have a thriving economy without an excellent education system. OPSEU represents approximately 50,000 frontline post-secondary education workers across the province. This includes college faculty, full-time and part-time support staff, and university staff and faculty. We continue to call on the government to recognize the right of part-time college faculty to join a union. The government’s underinvestment in Ontario colleges and universities has led to privatization and outsourcing, putting staff and students under increased stress as they struggle with precarious work and sky-rocketing tuition. Invest in our colleges and universities to ensure a strong future for Ontario. Ontario colleges and universities receive less funding per student than any other province. Ontario can do better. It is time to invest in our future workforce. We must fully commit to the faculty and support staff who deliver training and services. Excellent education depends on frontline workers. Recognize the right of part-time workers to unionize. A strong union and fair collective agreements benefit the students, workers and all Ontarians. The government must direct the College Employer Council to recognize OPSEU as the union of part-time and temporary college faculty, and conclude a first contract with part-time support workers that includes equal pay and job security. Commit to equal pay for equal work, and end the reliance of Ontario colleges and universities on precarious work. Most of the jobs in Ontario’s colleges and universities are precarious. It is not fair to either students or frontline workers when there is a constantly changing and underpaid workforce. Drastic underfunding has led to wage discrimination against part-time, temporary and contract workers, who do not receive pay that is equal to those doing the same or similar work in full-time permanent positions. Reinstate the College Task Force. This government must bring back the College Task Force as an innovative planning body for the future of the college education system. The Task Force was launched in an arbitration order that followed college faculty negotiations. OPSEU has filed a Charter challenge over the task force’s cancellation, but government can save legal costs by simply reinstating it. The education system will benefit hugely from the shared expertise of all stakeholders, including college and university workers, students, administration, employers, and government. Provide free education to all post- secondary students. Downloading the cost of education onto students and families creates barriers to access. Rising student debt can be mitigated by reinstating the grants that were recently repealed. Students currently owe $28 billion to the government. Tuition fees have tripled since 2001, and those costs increase year over year for families that must take out loans and pay interest. Place a moratorium on the outsourcing of IT services, and invest in on-site expertise. Contracting out IT services means a loss of specialized institutional knowledge, and also takes away access to jobs students need to help support their studies. In-house IT services provide quality support that cannot be provided by privatized operations. Protect the quality and integrity of public college and university certification by ending external partnerships with private colleges and overseas campuses. When our public post-secondary programs are delivered by a private college or university, everyone loses. Students lose access to services such as libraries and counsellors. The public education system loses enrolment. Lack of regulation creates a risk of substandard program delivery. Partnerships with overseas campuses have resulted in financial losses for Ontario. For example, Algonquin College lost upwards of $5 million after it established a campus in Saudi Arabia. Underfunding has led to many colleges outsourcing program delivery to private colleges, which are unable to provide the same supports and services to students. This practice devalues college certification and unfairly downloads cost onto students. Reinstate provincial funding of new university and college campuses, including the Francophone University. Immediately restore funding for the proposed French University, and the planned campuses in Brampton, Milton and Markham. Reopen the University of Guelph’s agricultural campuses in Kemptville and Alfred, which perform vital training and research for farmers across Ontario. Without government support, these new campuses may be forced to proceed with private funding, which will result in the further prioritization of corporate profits over quality education. Invest in English‑language training for new Canadians. Ontario students all deserve the training and support they need to get a good job. When new Ontarians succeed, Ontario succeeds. OPSEU represents more than 3,500 education support staff at Ontario’s Boards of Education. Ontario classrooms and families depend on their expertise to create safe learning environments and help special needs students succeed. This government has put all funding promises on hold, hurting families throughout the province. Invest in supports and services for students with special needs.Investing in full-time, permanent jobs for education support staff will mean consistent and high quality services for students with special needs. Underinvestment has led to jobs that are discontinued over March Break and the summer months, forcing workers to apply for employment insurance benefits. This is bad for workers, and bad for students and their families. It also puts unnecessary extra pressure on the EI system. Ontario needs a provincial standard for these workers, similar to the one currently in place for school teachers. Invest in reducing and preventing violence in the workplace. A recent survey of our members reveals that a significant number have experienced violence in the workplace. Government must ensure proper staffing and training so our members can reduce violent incidents, and fully support those who have experienced violence. Reducing violence is the right thing to do, and will help reduce the costs of lost time and productivity. Commit to funding afterschool programs. All students, including those with special needs, benefit from high- quality after-school programs. Ontario families with special needs children and teens are especially dependent on these supports. Provide stable funding for Indigenous school services. Reliable investment is required to meet the needs and challenges faced by Indigenous students. Northern communities are particularly dependent on these supports, and the urgent demand for programs is on the rise. It is often said that “the best social program is a job.” But that is simply not true when the job is precarious, dangerous, and pays poverty wages. The improvements to the Employment Standards Act (ESA) and the Labour Relations Act (LRA) contained in Bill 148 were a significant step towards ensuring that all Ontarians could count on decent pay, decent working conditions, and decent job security no matter where they worked. Unfortunately, the more recent Bill 47 wiped out the progress made in Bill 148 and took a significant step backwards. Restore the minimum wage to $15 an hour for 2019, with provisions for annual cost-of-living increases. If the government’s goal is to make “Ontario Open for Business,” it must ensure that the people of Ontario have enough spending money to buy the goods and services being offered by business. The tax cut for low-income earners is a poor substitute for a decent minimum wage; economists have shown that it will leave low-income workers with less than half the money a $15-an-hour minimum wage would have afforded them. Restore sick days, scheduling rules, and equal pay for equal work provisions. Workers are most effective and productive when they are treated fairly and with respect. A modest number of paid sick days, rules preventing last-minute shift cancellations, and a process to ensure equal pay for equal work are all vital to fair and respectful workplaces. Invest in pay equity. The gender pay gap persists. Women continue to earn around 30 per cent less per year than men and are more likely to be precariously employed. But achieving pay equity will take investment – government must ensure that all public sector employers receive adequate funding in order to meet their legal pay equity obligations. Ensure workers can exercise their right to join a union. The Supreme Court of Canada says all Canadians have the constitutional right to join a union. But Bill 47 put in place rules that make it easier for employers to intimidate and pressure their employees not to join a union. Restoring “card check certification” will lead to more unionized workers, which will lead to less dangerous and precarious work. Ensure fair and consistent bargaining across the province. Central bargaining can be good for both employers and workers. It facilitates focused discussions, establishes clear industry standards, and minimizes costly labour disruptions. Central bargaining can also be a significant cost-saver for government. Currently, a large number of the private and non-profit organizations delivering public services spend a portion of their budget hiring their own high-priced human resources consultants and lawyers during bargaining. Centralized bargaining would eliminate this waste. It is vital to the future of Ontario that the recommendations of frontline public sector workers made through their union are acted on vigorously and without delay. Public services are the great equalizer in Ontario society. They ensure that nobody gets left behind, but to fulfill that mandate they must have the resources they need to perform that role. Strong public services are also crucial to ensure a healthy private sector in Ontario. It is impossible to have one without the other and the people of Ontario will accept nothing less. Good jobs in both the public and the private sector are the key to prosperous and healthy communities. An economy dominated by precarious work and underfunded public services, cut to the bone through years of austerity and privatization, has negatively impacted Ontario’s reputation as the best place in the world to live. Now is not the time to fabricate a financial crisis. Instead, it is time to prudently invest in ourselves. Frontline workers are the people who keep the wheels turning in Ontario and the unions that are their voice must have an equal seat at the table with government and business. Whether they work in the public or the private sector, frontline workers want to help build a better Ontario for our children and grandchildren in a climate of harmony, not conflict. There is much work to do. Let’s get started.